I love banana chips. When I was younger, I would always buy banana chips out of the bulk bin at the local health food store and usually devour whatever I bought. That was until I realized the ridiculous amount of sugar (and sometimes high fructose corn syrup) they had in them (like these). So, I gave up eating banana chips and moved onto other snacks. However, over the years I’ve worked on this banana chip recipe to replace the sugar-laden bulk bin banana chips. A few notes: This recipe is not easy. It’s easy to fail (I still do occasionally when I want to rush them along). So, it’s imperative that you make sure your oven temperature is accurate (any lower and it will take forever and any higher, you risk burning). Also, the use of just-ripe bananas helps you cut those slices to about 1/16 inch thin (another must). Thicker slices will take much longer (but will work, just like dehydrating any other type of fruit). If you pull the bananas from the oven too soon, they won’t be crispy. As a result, it’s better to slightly overcook than undercook. Spices: Sprinkle the banana chips with a pinch of cinnamon or a mix of spices (think pumpkin pie spice with clove, nutmeg, and cinnamon). Dehydrator: If you have a dehydrator, this recipe works just as well (if not better). Use your dehydrator at 135˚F and start checking around the 5 hour mark for chewy banana slices. One note, I’ve found the oven gets the chips much crispier. Sweetener: This banana chips do not really need extra sweetener but sometimes it’s nice to have a touch of honey or maple flavoring. Mix a tablespoon or so of honey or maple syrup with the lemon juice before spreading onto the banana pieces. 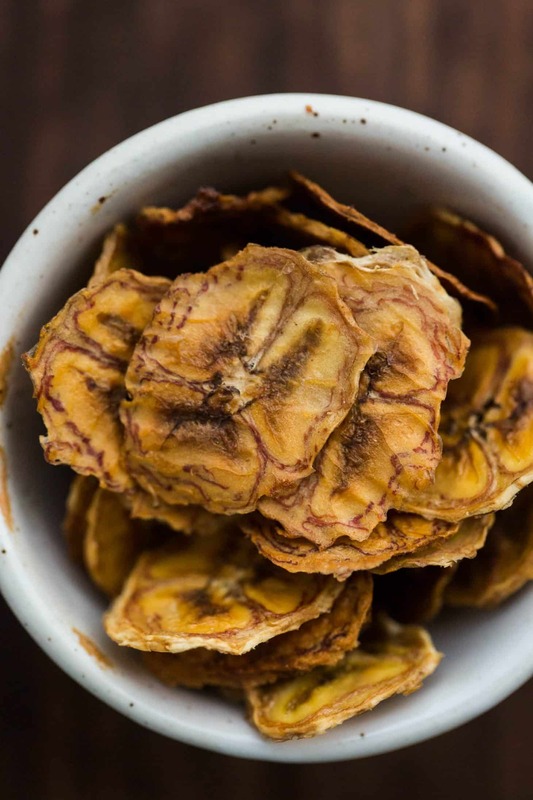 Oven-dried banana chips to replace the store-bought banana chips that often have extra ingredients. Preheat oven to 225˚ F.
Slice bananas into 1/16 inch slices and lay in a single layer on a baking tray covered with parchment paper. The key is making sure they are all the same thickness. Brush with lemon juice. Bake until bananas have dried out, 2-3 hours. Check bananas after about 90 minutes and peel up from the parchment paper to help air circulate a bit better (I used my fingers as the bananas are still a bit moist). Also, if you find the bananas are sticking and not able to easily flip, keep baking for another 20 to 30 minutes before flipping. Chips are done when they have deepened in color (dark gold to brown), have no visible moisture, and begin to crisp up as they cool when they are lifted from the tray. Remove from oven and let cool to a crisp. Occasionally you may have to pull done ones from the tray while the remaining chips are still cooling. If you remove the banana chips too soon, they will not start to crisp after about 5 minutes of being out of the oven. If this is the case, return them to the oven for another 15 to 20 minutes. Tips + Tricks: This works best if you slice the bananas evenly but you if some are thinner, be sure to check and pull the done banana chips as needed. Thats fantastic because your right i think the ones you buy really are not good for you! Bananas cost an absolute fortune at the moment here in sydney, the crops were destroyed by the floods and cyclone. Nice! I love me some banana chips, but hate what is usually in them. Yum! I made some of these a few weeks ago, I love that they are a healthy alternative to banana chips! It’s amazing that some things you think would be good for you could be so bad for you! But what a great idea…I’ll have to give these a shot! I just came across your website, and your recipes and photography look amazing! Thanks for sharing your talents with us. Recently, I finished my first cookbook, and I included some vegetarian ingredients in my alternatives for every recipe. For my next one, I’d love to learn more about the vegetarian diet and connect with someone like you who adheres to the diet. Would you be willing to answer questions as I go along writing the recipes? I would like to know how to make these, but I don’t see the recipe anywhere. 🙁 Am I just missing it? If you read the post, the link is there. It’s not my recipe. Hi Mike, Done! Thanks for letting me know. Would this also work in a dehydrator? I wonder…. While I’ve not tried it, I think it would! I tried these last night because I love finding new ways to snack healthfully! Unfortunately, even after 3.5+ hours in the oven, there was still a fair amount of moisture around each banana chip and they never crisped up. Have you had this happen? How do you know when they’re dry enough in the oven that they’ll crisp up once out of it? Hey Meredith, They should be fairly crisp before you take them out of the oven. The only thing I can think is that the banana slices need to be thinner. I would also recommend a banana that is barely ripe. So still a little green? Not quite- I try to grab them when they are just yellow but still firm. Is it meant to be degrees Fahrenheit – I cooked mine 175 degrees Celsius and they all burnt to a crisp! It is- I’m US based, so everything on the site is in Fahrenheit. This is great – thanks for sharing. I do something similar with plantains, instead of frying them. Yes! I was wondering if the same would work for green plantains, as I love their crunchiness and saltiness but hate how smelly and messy it is to fry them. Brushed with lime instead of lemon juice? Thanks for the idea Erin! Oh, that sounds delicious- I bet it would work! If you try it, let me know! Love the idea of this recipe. Tried it today but wasn’t very successful. Baked them for 2 1/2 hrs but once cooled over half of them I couldn’t get off the parchment. Will try again and remove them when warm. Any suggestions or other ideas would be great. Would love this to work. Thanks for posting the recipe. I would check the thickness of the banana. I also just made these again this morning, for the first time in ages, and bumped the temperature up to 225˚(I think my oven at 175˚ is a bit cool). Try that as well! Hi Ella! I tried your banana chip recipe and followed it exactly, but somehow my bananas got totally burnt! Do you have any tips for the future? I really want to make these! Thanks! Hi Barri- sorry for the delayed response! My first piece of advice is to make sure your oven temperature is correct (and in Fahrenheit!) At such a low temperature, it would be nearly impossible to burn these (unless left in there for many many hours.) I’d start there and see where that gets you! I ate these when in Peru and loved it! I am totally gonna try to do it at home. Just a question – you put no salt at all? Would you think it may work? You could definitely add a pinch- I didn’t find they needed it. I had found a recipe like this a long time ago, but couldn’t find it again. So I found yours this time. I’m making them for dog treats, I just add a little bit of honey to them. These look so good! I would be interested to know if the bananas keep their nutritional content after cooking them like this? Great work with the blog, keep it up! In a pinch, you can just ditch it- it’s used primarily to keep the bananas from browning during the cooking process. 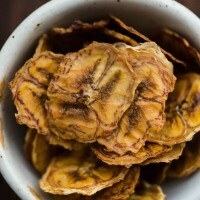 I would LOVE to make my own banana chips! I totally buy the ones from the store and yeah there is a ton of sugar. My dogs have developed allergies to all those preservatives so I am trying to cut out all the junk that they put into dog treats! I am going to try this recipe! So the temperature 225º, is that Fahrenheit or Celsius? I followed the recipe step by step however living in the UK, I thought that it was 225 degrees Celsius and set light to my kitchen. Sorry, I’m slowly going back through all my recipes and adding F to the temperature. I have a gas oven and the lowest it goes is 300 degrees F. Do you think 90 minutes should be enough? I love banana chips but the kind at the store are way too fattening! Thanks! I would just watch them- check starting after 30 minutes and then go from there. I’m not sure how greatly the degree change with change the time but it should still work! What if I sweeten it with organic honey? You can try but the chips are fairly sweet by themselves. I wouldn’t add too much! Are they supposed to be crispy or more chewy after they’re cooled? Crisp- if they are chewy they didn’t cook long enough. Just made them and we already finished them, my toddler loves it! Will make again. Thank you for the recipe! I wonder, could you recommend other fruits that this might work with as well? Great site! You can dry out any type of fruit to make chips- apples are another favorite of mine. Definitely going to try this but I was wondering how to store them and how long they keep? I got some left over bananas, I might try to make some later. Out of curiosity, can I make them without the lemon juice? Yes you can- they’ll just turn a bit more brown! I just found this afternoon and quick Google search…and after polishing off a container of store bought banana chips! I can’t wait to try these this weekend. It takes cooking them for awhile and I’ve actually found that the thinner I go and the longer I cook them, I’ll end up with a crisp chip. I’ve never had bare natural chips so I can’t compare! 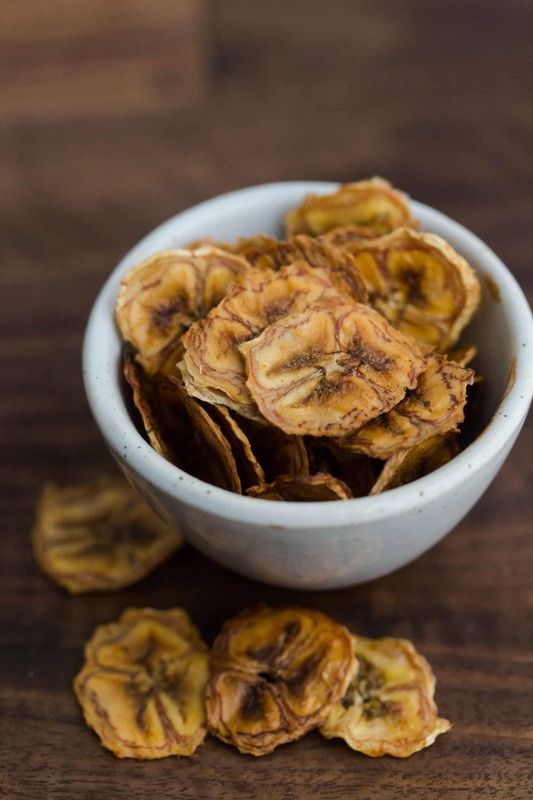 I really enjoyed your recipe — and the process of making banana chips for the first time! The chips were crispy after cooking, but became more chewy after a few hours. Would you attribute that to a need to cook longer? I look forward to sharing the link for this recipe (and your site) in my blog. Any opportunity to decrease the additives in our food is great. Thanks for sharing and we can’t wait to make these again! I believe you could- I’ve never tried it but I believe it should work. Thank you! I have loads of banana trees in my garden, all in fruit, so didn’t want to waste them! We are doing a space project at school, so I will be giving out my samples of dehydrated ‘space’ food!